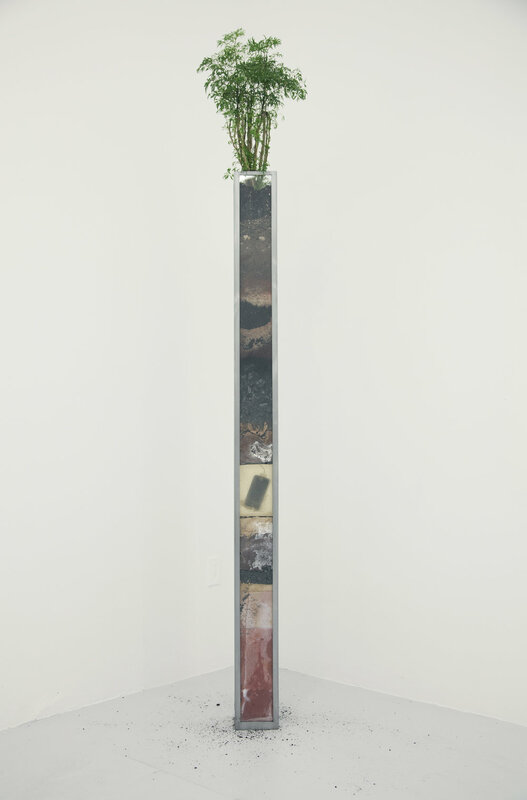 Fallen Cloud is the largest in a series of works based on Apple’s waiting cursor, the “Spinning Pizza of Death” (a.k.a. S.P.O.D., spinning pinwheel of death, pinwheel of death, S.P.O.D. etc.). Designed and created for Evan’s installation “The App Store”, Fallen cloud slowly spins to emulate the look of the original cursor. S.P.O.D.2 is the mid-sized piece in a series of works based on Apple’s waiting cursor, the “Spinning Pizza of Death” (a.k.a. spinning pinwheel of death, pinwheel of death, S.P.O.D. etc.). Designed and created for Evan’s installation “The App Store”, Fallen cloud slowly spins to emulate the look of the original cursor. S.P.O.D. is the smallest piece in a series of works based on Apple’s waiting cursor, the “Spinning Pizza of Death” (a.k.a. spinning pinwheel of death, pinwheel of death, S.P.O.D. etc.). Designed and created for Evan’s installation “The App Store”, Fallen cloud slowly spins to emulate the look of the original cursor. Black powder sifted out from a blended iPhone housed in a mirror polished, water-jet cut aluminum and glass housing. When flipped, the black powder siphons downward like an hourglass, but does not determine a length of time. Shown in this image is a special edition proof of iFlip, which is mounted on an under-lit cast resin and aluminum display. Originally designed for Evan’s installation “The App Store”, Kaleidogram is a cast brass iPhone accessory and necklace that kaleidoscopes the the iPhone’s camera app. Shown in this image is a special edition proof of Kaleidogram, which is mounted on an under-lit cast resin and aluminum display. Layers of concrete, dirt, resin, coal and sand allude to geological core samples. Embedded in a middle layer of the piece is an iPhone cast in resin. A water jet cut aluminum panel housing an Arduino chip and LEDs that spin to emulate the “shutdown symbol”. An iPhone cast alongside a pair of headphones and real insects in amber dyed resin emulates real amber aged millions of years. 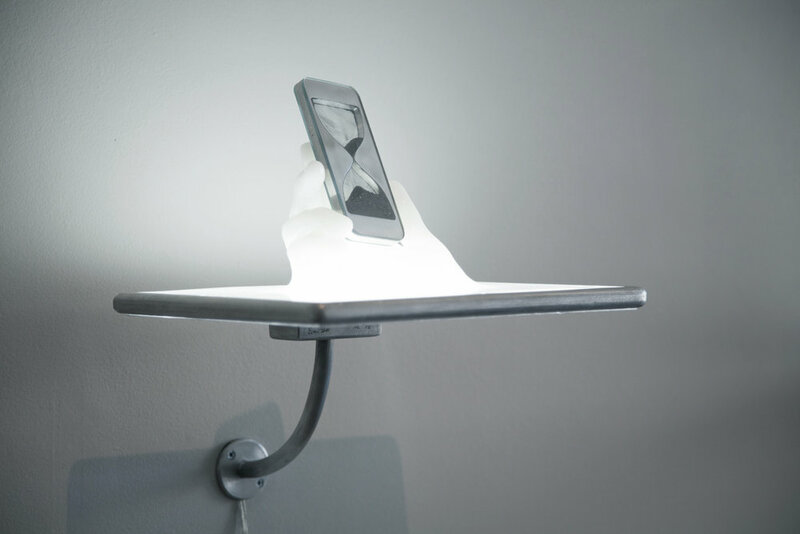 The piece is displayed on a powder coated steel stand emerging from an under lit aluminum and acrylic pedestal. A Kaleidogram cast alongside real insects in amber dyed resin and concrete emulates real amber aged millions of years. The piece is displayed on an under lit aluminum and acrylic pedestal. 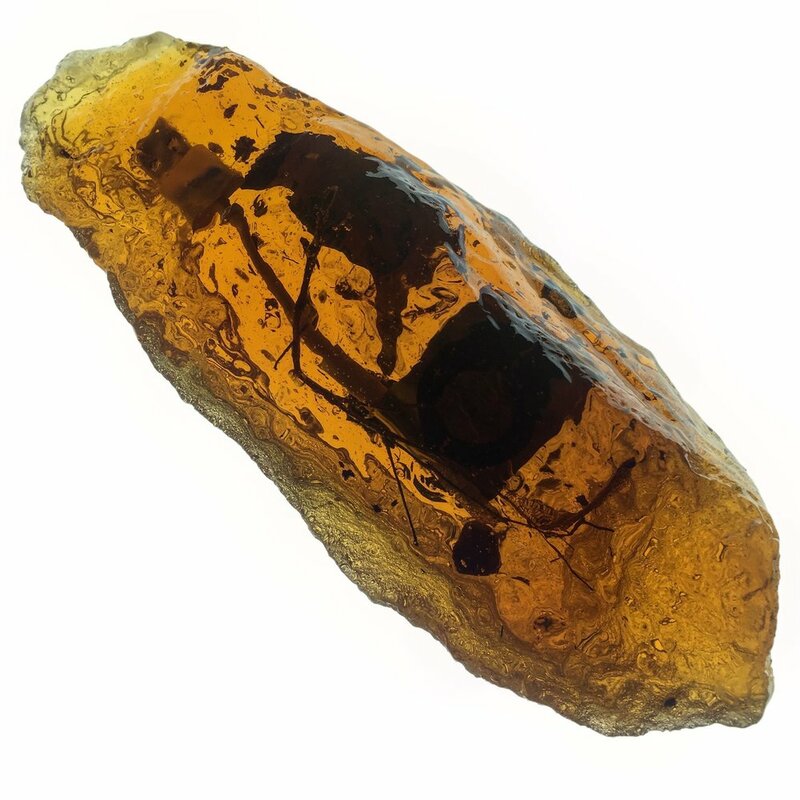 A FitBit cast alongside granola and real insects in amber dyed resin emulates real amber aged millions of years. The piece is displayed on an under lit aluminum and acrylic pedestal. 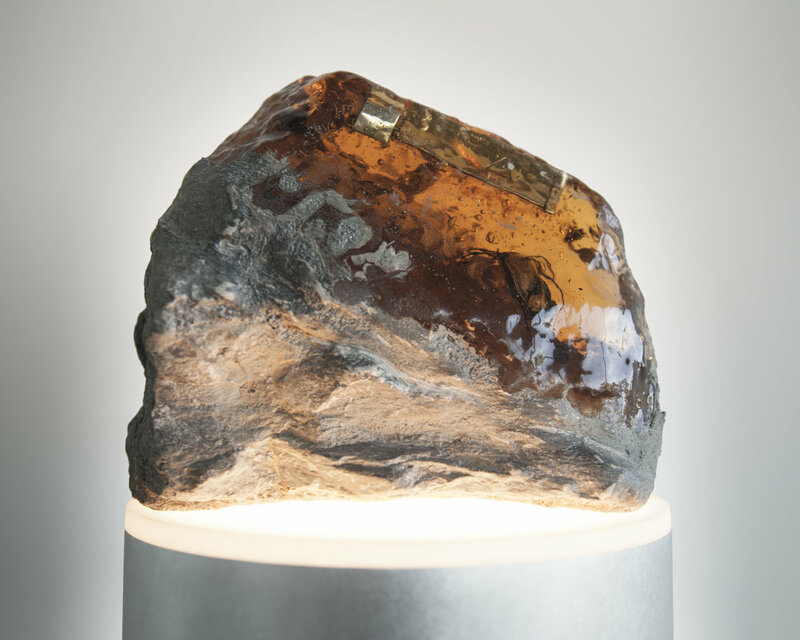 An iPod Shuffle cast alongside granola and real insects in amber dyed resin emulates real amber aged millions of years. The piece is displayed on an under lit aluminum and acrylic pedestal. Two prongs of a 110V household plug cast alongside real insects in resin and concrete emulates real amber aged millions of years. An assemblage of twigs cast in bronze resembles a popular consumer model of a drone. The bronze cast is hung from the ceiling and is wired with geared motors to spin twigs in place of propellors. Below, a taxidermy pigeon is placed on the floor. 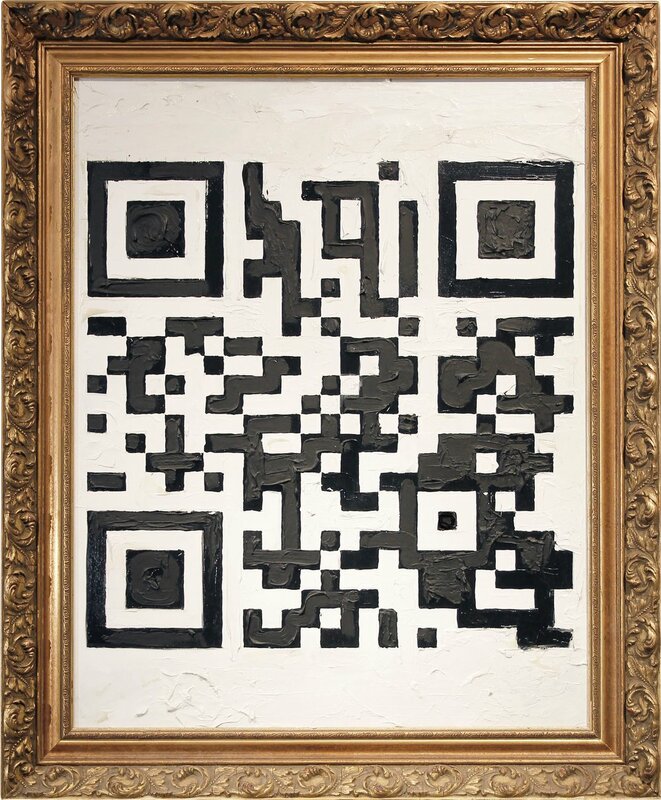 A painting of a QR code, that when scanned, brings you to the google image search for “Mona Lisa”. 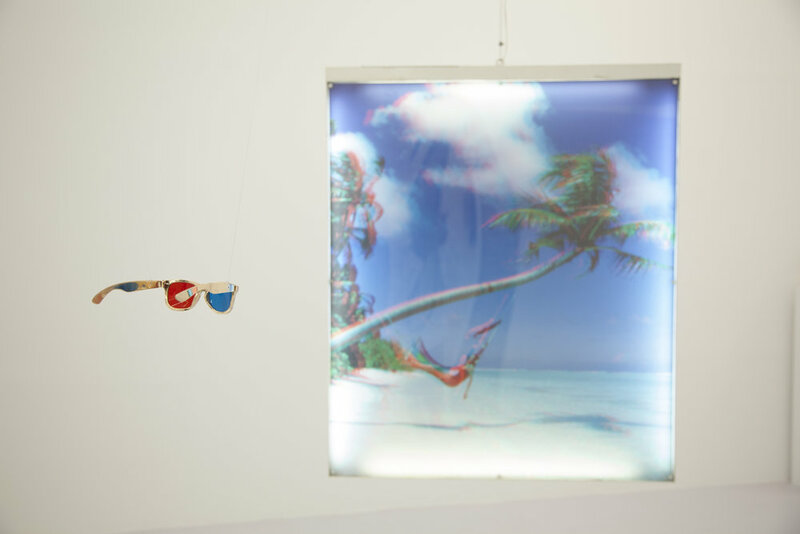 "I'm in the mood for caviar"
A double sided steel and acrylic light box houses both a vinyl print of a woman on a hammock on a beach, and a cruise ship. Also hanging from the ceiling are a pair of Ruby and Sapphire encrusted, Brass and Nickel Soldered, Ray-Ban glasses with 3-D lenses. 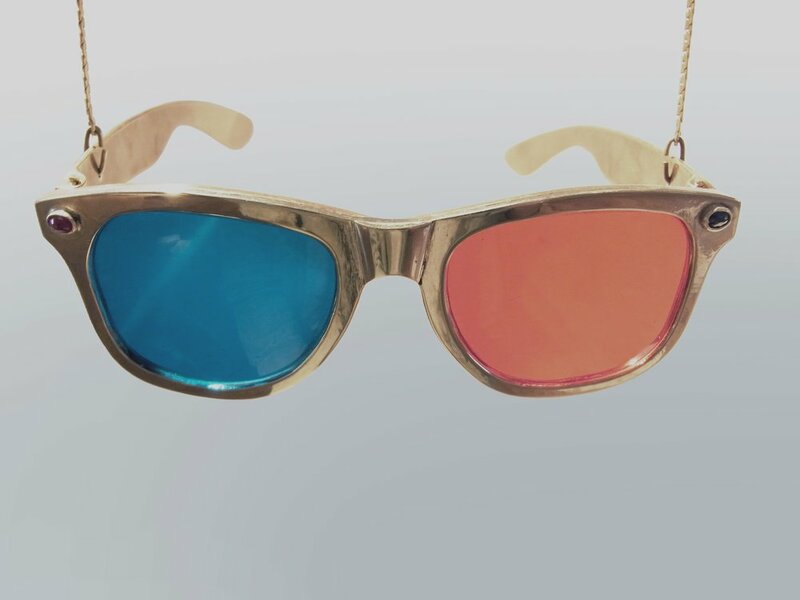 A detail image of “I’m in the mood for caviar”, showing the ruby and sapphire encrusted, brass and nickel soldered model Ray-Bans. A virtual reality headset, modeled in cardboard and duct-tape then cast in aluminum, fits two iPhones. When worn over the head with two iPhones displaying their camera app, the glasses lenses welded into Nocuous Rift stereoscope the two iPhone screens to create a three dimensional image of what the cameras see. A polished nickel housing around a leather band houses 9 USB drives for a total of thirty-six gigabytes of memory.